The human animal bond we share with our pets is strong. We love to spoil them by buying them toys, cute little coats, beds (or let them sleep on our own) and worst of all feed them treats. A well rounded figure is increasingly being perceived as normal amongst many pet owners. Society has become so accustomed to this new ‘normal’ that we are increasingly seeing fit, well muscled dogs brought into us because their owners are concerned their dog is underweight or suffering malnutrition! 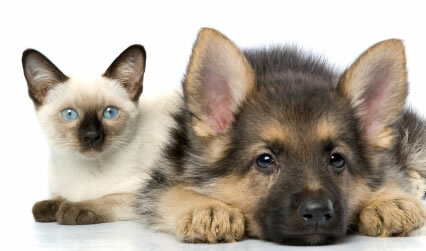 Sadly some 24-30% of pet dogs and 25% of cats are classified as obese. By doting on our pets we may actually be killing them with kindness. As in people, obesity in dogs and cats is known to cause or exacerbate a number of medical conditions and contributes to a shorter life expectancy. These include cardiovascular and respiratory diseases, arthritis, spinal disease and ligament ruptures, diabetes, and even cancer. Overweight patients also present an increased anaesthetic risk and are more prone to heat stress. These patients are generally less active and even incapable of exercising for extended periods which negatively affects their quality of life. Genetics, breed, activity levels, age, calorie content of food and desexing are factors known to influence our pet’s propensity to gain weight. The presence of these factors shouldn’t serve an excuse to have an overweight pet, rather an indication to do something to prevent it. We have many reasons cited by owners trying to excuse their pet’s larger stature. Do these sound familiar? ‘They really don’t eat that much’, ‘I only give them a handful of dry food every day’, ‘I only feed them once a day’, ‘She’s desexed so there’s nothing that can be done about it’. Regardless of how convincing these excuses may seem to you, an overweight pet quite simply eats too much for their metabolic requirements. Rewarding pets with treats is one of the most common offenders. These may seem small enough but they contain calories nonetheless and they need to be included in their daily calorie allowance. Feeding table scraps is an all too common problem which contributes to obesity in our pets. Owning more than one pet may necessitate feeding them separately to prevent one eating the others food. This is inconvenient but not as impossible as some people may think. Feeding guides on pet food packets serve as a guide only. They are based on ranges and average caloric requirements for an ideal body weight. If a guide says feed 5-10 kg dog 2-4 cups a day, this does not necessarily mean it is ok to feed a 5kg dog 4 cups, particularly if they are sedentary or already overweight. o It is important that everyone in the household is consistent with feeding of their pets. It’s not uncommon for pets to be fed twice by two different people. Recognising your pet is overweight and avoiding some of the common causes of obesity are the first steps in tackling the battle of the bulge. Getting rid of excess weight is the next step. This involves formulating a weight loss program which includes diet, exercise and monitoring their progress. We will discuss this in more detail in part 2 of this series in the October edition of The Local Bulletin. Asher Dessaix. Anstead Veterinary Practice.